We've hit a milestone in Siege of Dragonspear's development. As of this week, we are officially CONTENT COMPLETE! “Content complete” means that everything that belongs in the game is in the game. Areas are finished, monsters are all in place, items have been crafted, characters stand where they're supposed to stand. All the quests and subquests are finalized and implemented. We decided that some of the older areas we reused from Baldur's Gate: Enhanced Edition could be improved, and so the artists repainted the city zones to make them sharper and more in line with the updated (but still classic) Siege of Dragonspear look. Holiday Dorn is pleased by this news. QA (quality assurance) is the process of making sure all the content works the way it's supposed to. We test out the game on multiple platforms over and over again to find any issues that need correcting before the game can launch. Our goal is to release a game that's fun, complete, and bug-free. The progress of our QA testing will drive the eventual release date in 2016. 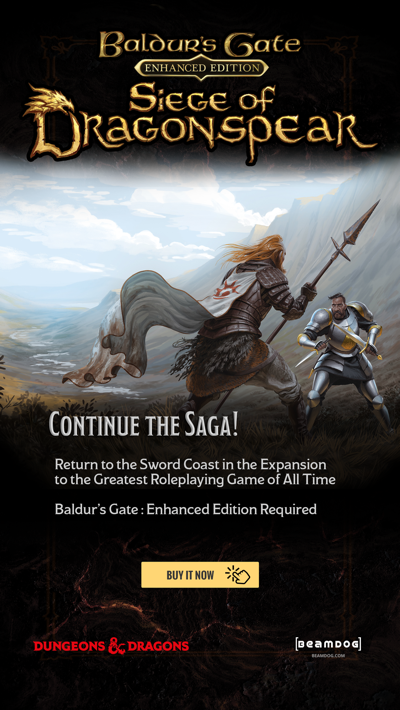 We've also slipped some Siege of Dragonspear content into December's issue of Dragon+. You'll find an original short story about Glint Gardnersonson, the gnome who gets into trouble far more easily than he gets out of it, tucked into its digital pages. 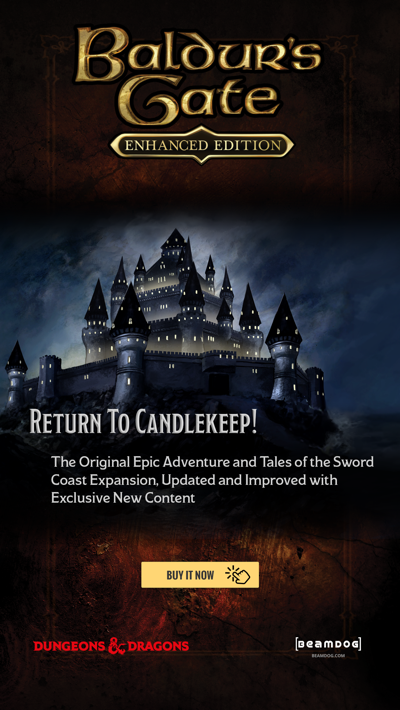 We have more short stories planned to give you insight into the world of Dragonspear and the characters who inhabit the game. We have a number of great sales coming up this month. First of all, we've arranged to provide our games through Bundle Stars and they're kicking off our partnership with an incredible 70% off sale. This sale (Baldur's Gate: Enhanced Edition, Baldur's Gate II: Enhanced Edition, and Icewind Dale: Enhanced Edition) is for two days only (December 15-16) for the Steam version of our games. That's early enough to make for a great holiday gift! We're also planning an App Store sale for 50% off all Enhanced Edition games. That sale runs from December 19-31. Thank you for all your support this year, and have a safe and happy holiday season!